SANTA CLARA — Check out my Periscope report for Thursday’s training camp practice. I will post detailed breakdown of the good and not so good from today, so stay tuned. Also, check out my video of one-on-one pass-rush drills from Thursday’s practice. Have to agree McGlinchey looks pretty awful in 1 on 1s. I understand the pick, but as I said when they drafted him, he doesn’t look a great talent. More a solid player. And so far that might be generous. I have also noticed that Attaochu only has one rush. And doesn’t use his hands well. Troubling indeed. Jimmy G will make him look adequate in pass pro. He’ll probably also get some help on third and long. It’s much more important that he get up to speed on run blocking. I won’t be surprised if Taylor starts the season on PUP and James starts. Jullian looking like Jason. Armstead starts the season on PUP. Cooper should be ready Sunday to fully participate. I’d wait until the 3rd preseason game to fully evaluate the right side…. Troubling, soon to be alarming…? C’mon Grant — please impose a quota on the number of your daily outrageous predictions…. NFL training camp cuts will be the 49er Gold Rush at right guard. It’s fun… Sample a number of newspaper-sponsored/owned NFL team blogs around the country–a large dose of hair-on-fire panic and indignant outrage, some great insight, occasional over-the-top humor, creative insult hurling, blatant gaslighting, and cautious optimism–here and there. Let’s have some entertaining preseason games and get on with the business of the regular season. Is it just me or does it seem like comment volume is way down lately??? I’ve noticed the same. I believe that it is happening because many don’t want to sit thru the entire video and Grant’s written posts are coming to late in the day, especially for those of you who don’t live on the west coast. Speaking for West Coast self, I am absorbing every minute of the Grant show leaving little time left for comment. Baring IR placement of a WR, I’m thinking Garcon is the WR who is gone from final group. I’m hoping McGlinch brings good run blocking to help distract from any continued problems with pass blocking. Sherman as safety? Slow feet, great hands and Stanford smart. I am old enough to remember that, at one time, the rub on that Montana guy was that he could not throw deep. It still worked out OK.
Can they sneak in Breathard once in a while for the deep pass? I’m thinking that the interior of this D line is going to be so disruptive that they will make even a mediocre edge rusher look good. Salah needs to seriously consider a power front – some version that fits the tools he is dwelt. Witherspoon was tested today; does he have the marbles to grow from this? It’s hard to have much discussion when most responses are stuff like. “Hey they won the last 5 games with worse”, “we’ll see what happens in a few weeks”, “limit your crazy predictions Grant”. It’s not new for Grant to be ripped when he says anything less than flowing, but it kinda feels like the whole “FAKE NEWS” movement has found its way here. If it’s not good news, it’s fake news. Haven’t you heard?? Volume is down. A deluge of mixed info coming out of camp contributes to that–especially challenging when we have 2-4 topics opened per day. Should pick up as we pass through the Cowboy game, or sooner if something bad or completely nuts happens–like Garoppolo breaks a femur and is out for the year, or John Lynch bails and returns to the broadcast both, or…..
Did you really just say that about Garoppolo’s leg? Yes…. I’m not asking for it to happen, just suggesting that something of that magnitude would certainly up the comment count. So too would a Press Democrat decision to put this blog and Grant’s material behind a pay wall. Wouldn’t that be a kick! The broadcast booth is fine..
GRANT….PLEASE speak up during the video sessions which is great to see but that damn loud asz bass music drowns you out. Place the mic closer or something. Why can’t they play Metallica or AC/DC once in a while ..Thanks, keep it up bro. I want to hear more of what you are saying. It is difficult enough to ID person in drill it is even more so from our view. I find myself constantly pulling up rosters which are not always accurate. On the other hand, unlike Charles Haley, I imagine you have to be somewhat more discrete. Request aside, this line drill video is a nice new addition. I have to say I really enjoy these periscope perspectives along with the (new) 1 on 1 line drill videos. For me this is not unlike years ago hanging out at Rocklin. There, I would often be drawn to the critic in the crowd. (A) It made it more interesting. (B) I would learn more. (C) As the season unfolded I would be more often pleasantly surprised rather than unpleasantly disappointed. This plus 1 on 1 line drill video plus The Good and not so Good summation and finally plus the discussions (sans trolls) all of this is like I am almost there and yet some one, other than I, deals with the traffic. Is there any chance the PD would put you up at one of the hotels adjacent to Levi. You could write your post practice articles soon after practice and not have to spend 3 hours or more in your car on practice days. It might add up to less than 20 days. I wish. I’m writing the post-practice report right now. Any follow on to your suggestion to trade IIRC a pick, possibly a first rounder, and Foster for Mack? Is he worth that price plus the average $20 million per year? What’s the contingency plan if Mike McClinchey is not ready to start? Wasn’t there some buzz around Darrell Williams last year? I’ve heard little about him this training camp. 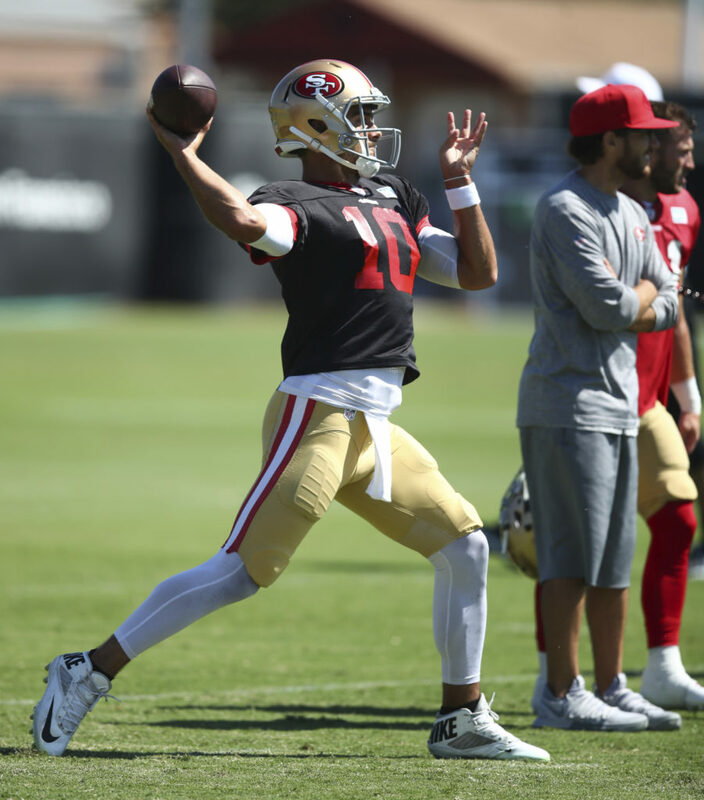 I am surprised you didn’t emphasis the connection from what you heard from Pettis today with your evaluation as to why he has problems in the middle of the field. You said it was because he seems tentative because he does not know where the defenders are. Well that was validated by Pettis’s statement that he is not focusing on the defenses but just the offenses at this point in time. What that tells us is that his problems in the middle of the field are correctable once he starts focusing on studying the defensive alignments. I said that two days ago on Periscope. You implied it but you didn’t emphasis it. I knew exactly what you were referring too but many other listeners and readers would not have made that connection. That is why I used the term Emphasis. Pettis’s statement validates your evaluation. That was the connection I was referring too. Grant, I wish to commend you on the improvements in your Periscopes. However, the extraneous distractions do bring down the quality of the broadcast. Maybe you could try producing your periscope in front of the 49er Museum. Then you could have a 49er poster or statue in the background, instead of a food service area. It would be nice to have you call out the names of all the players during the 1 on 1 drills. Maybe get a zoom feature on your camera. These are all technical issues. The content of your broadcasts are scintillating and eagerly anticipated. Keep up the good work. Good suggestions. Believe it or not, my phone is zoomed all the way in.